A couple of months ago there were strong rumors about a Dual-SIM & Dual-Core Smartphone from Samsung, which was to be called Samsung Galaxy Core I8260 Smartphone. 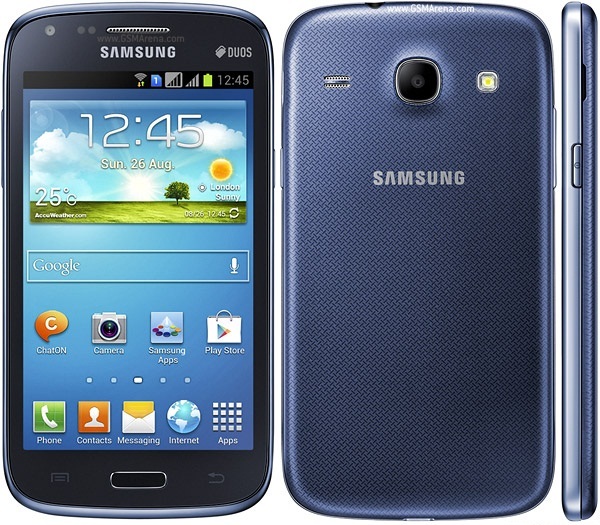 Today the rumors are confirmed and Samsung is ready with its latest offering with Samsung Galaxy Core I8260. The question though is, "with so many smartphones flooding the market of late, will this new entrant prove to be a hit?" Considering that it is quite different from the Mega Samsung Galaxy series from the same company, there is belief that the new dual SIM smartphone will make a mark for itself. So today we will show you the complete Review of Samsung Galaxy Core I8260 Smartphone with its Specifications, Price & Availability Details available below. Though the specifications are believed to be medium or mediocre, rather, with some of them akin to those of the Galaxy series, there is still hope that this one will be a great hit. It will have Dual-SIM capabilities and be good for multitasking, which can be found in the more expensive models of smartphones that belong to the upper crest. The Samsung Galaxy Core I8260 is to run on a processor with Dual-Core, clocking at 1.2 Gigahertz. The random access memory is quite impressive with 1 Gigabyte which should make it fast enough. It will run on Android 4.1 Jelly Bean and have Samsung’s specialty which is the TouchWiz user interface. The hardware platform has been designed to easily run apps and games that will have high graphic content. The internal storage is quite sufficient at 8 Gigabytes, which can be expanded up to 64 Gigabytes through microSD cards. TFT LCD technology has been used for the 4.3-inch display screen that comes with a resolution of 480 X 800. There are two cameras, a VGA unit on the front and the snapper at the back is a 5MP sensor that can snap some great pictures, with a capability to record 480p videos as well. The additional features that come for a price that can be considered quite competitive include Global Positioning System (GPS) for efficient navigation, and the usual Bluetooth. 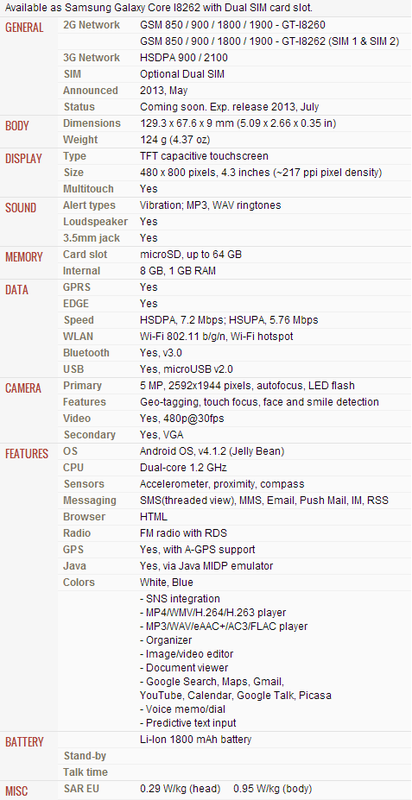 In addition there are the proximity sensor, accelerometer, and compass. The Wi-Fi capability lets you access the internet while on the go. The 1,800 mAh battery should last long enough, especially for people who keep moving around and use the Internet frequently. One great feature is the both the SIM cards can be used simultaneously, and another call can be received by placing the current call on hold. Though the practicality of this and the confusions it can lead to have to be experienced to get a hang of managing calls efficiently. The other interesting features included by Samsung include Smart Stay that smartly senses the user is still looking at the terminal and does not allow the display to dim and go on a power saving mode. One does not have to keep tapping any key to get the screen to brighten. Smart Alert is another smart feature that vibrates as soon as you pick up the phone, indicating that there are some notifications that need to be checked. Motion UI activates certain functions while the phone is in motion and the S Voice feature is similar to Siri from the iPhone, and serves as a great virtual assistant. On the whole the new dual-SIM Smartphone is smart and inexpensive enough to become a great hit.